Babymetal is a Japanese metal band. The members are Suzuka Nakamoto, Yui Mizuno and Moa Kikuchi. The band started in 2010. 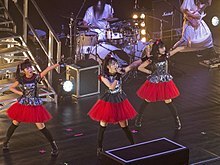 Their first album Babymetal was released on February 26, 2014 in Japan. This page was last changed on 20 March 2018, at 08:50.